Which of the 5 leaders highlighted in the photograph made the following statement? The picture shows the founders of OIC in Badshahi Mosque, Lahore, during the second Islamic Summit Conference held in 1974. 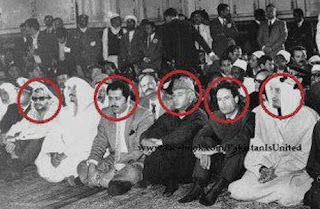 Identified by red circles, they are (from left to right): Yasser Arafat, Anwar Sadat, Zulfikar Ali Bhutto, Gaddafi and King Faisal of Saudi Arabia. The picture is circulating on the Internet these days with a suggestion that all these leaders got assassinated by the USA. It was emailed to me by a friend who wanted my opinion. The answer will be posted at this blog on Tuesday, November 1. Don't forget to come back and check! Since nobody has commented, may I not answer it yet? Bhutto... who else can say these words!